Thanasi Kokkinakis has saved Australia’s blushes with a stirring win at Queen’s Club after fellow rising stars Nick Kyrgios and Bernard Tomic suffered swift first-round defeats in a worrying Wimbledon preview. Kokkinakis, who completed a round trip to Australia over the weekend to visit his sick grandmother and arrived in London roughly 24 hours before his match, showed no signs of jetlag as he finished the stronger to beat Jeremy Chardy 6-7 (3-7), 6-2, 6-4. After jumping out of the blocks to take a 3-0 lead in the first set, the 19-year-old’s first-set hopes faded as his forehand began to falter and he became increasingly frustrated before losing in a tiebreak. However, displaying the qualities that have many believing him to be the best of Australia’s next generation, Kokkinakis fought back to rip through the second set with back-to-back breaks of the experienced Frenchman. Taking advantage of Chardy’s sloppy serving combined with his own 19 aces, Kokkinakis claimed an early break in the third and successfully held his nerve to serve out the victory, winning on his second match point in just over two hours. He faces seventh seed Gilles Simon of France on Wednesday (Thursday evening AEST) for a spot in the quarter-finals. 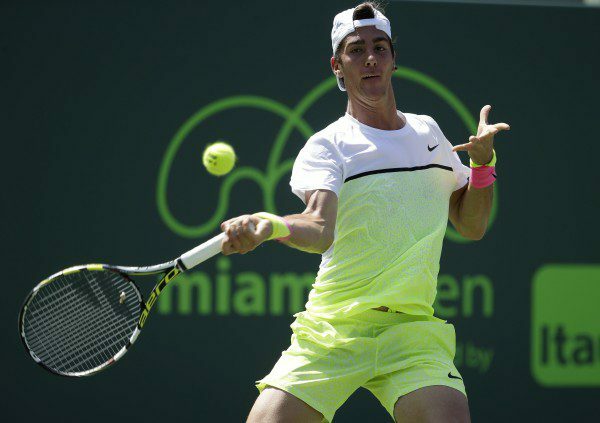 “It’s going to be a tough match, he’s a great player, former top ten and he’s around the mark now,” Kokkinakis said. Kyrgios displayed the best and worst of his game in going down 6-3, 6-4 to world number four and French Open champion Stan Wawrinka at Queen’s, mixing brilliant passing shots with overly ambitious between the legs and drop shots. The news was no better for Australia’s top-ranked male, with world number 24 Tomic losing 6-3, 7-6 (7-4) to American Steve Johnson on grass at the Gerry Weber Open in Halle, Germany. Kyrgios admitted to feeling below par both physically and mentally just less than two weeks out from Wimbledon, but maintained he would be able to lift his game for the tournament, where he rose to prominence last year with a stunning upset of Rafael Nadal. “I feel confident still,” he said. In Germany, seventh-seeded Tomic, who has risen up the rankings after a consistent first half of the season, was favoured to oust the American ranked 29 spots below him. But despite reaching the quarter-finals in Stuttgart last week, where he was beaten by eventual champion Rafael Nadal in a tight three-set match, Tomic was unable to build on his positive form.